U.S. employers added 213,000 jobs in June, continuing a hot streak. President Trump reckons he has enough of an economic cushion to ratchet up trade wars with China and Europe. Yet firms are already delaying investment and facing higher costs. The buffer may dissipate. 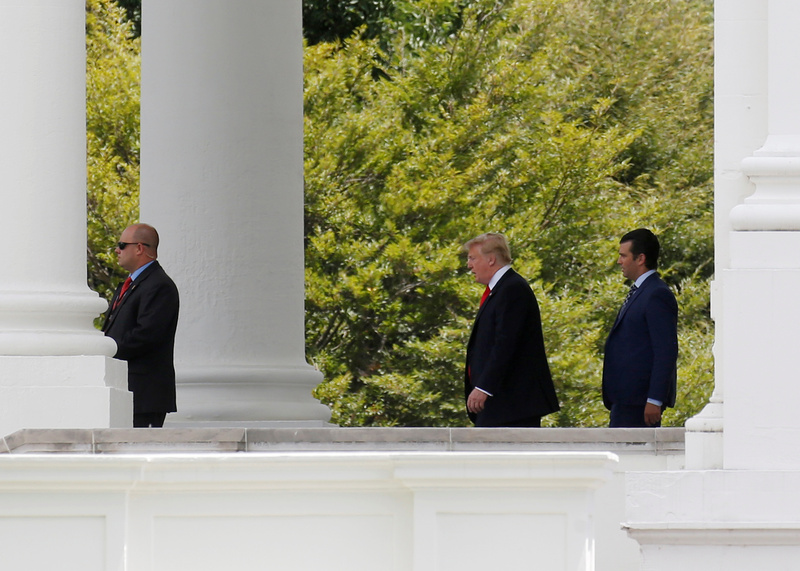 U.S. President Donald Trump leaves the White House with his son Donald Trump Jr. to get into his Joint Base Andrews bound motorcade for travel to Montana in Washington, U.S., July 5, 2018. The U.S. economy added 213,000 jobs in June while the unemployment rate rose slightly to 4 percent, the Bureau of Labor Statistics said on July 6. Economists surveyed by Reuters expected an increase of 195,000 jobs in June. Average hourly wages rose by 5 cents to $26.98 per hour, and were up 2.7 percent from a year earlier, unchanged from May. The labor force participation rate rose slightly to 62.9 percent. Employment in professional and business services increased by 50,000 in June while the manufacturing sector added 36,000 jobs. Figures for April and May were revised upward for an additional 37,000 jobs in those months. Over the last three months, U.S. employers added an average of 211,000 jobs per month. Separately, a 25 percent U.S. tariff on $34 billion worth of Chinese imports took effect on July 6. China said it would retaliate with levies on the same value of U.S. goods. The U.S. government is seeking public comment on proposed tariffs on another $16 billion worth of Chinese goods.